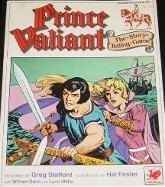 PRINCE VALIANT The Story Telling Game, 124 pages, Chaosium Publication 2801. Designed by Greg Stafford, Illustrated by Hal Foster with William Dunn and Lynn Willis. Produced 1989.One of the very best roleplaying games set in the time of King Arthur. Based on the strip stories by Hal Foster. Also full of advice on roleplaying, and beautifully illustrated (black and white). If you want more info, click on this link. Or go to this website, to read more. Thanks to Greg Stafford.